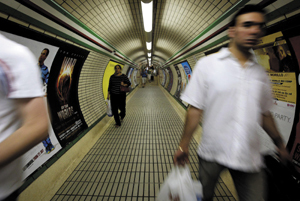 Investigators in London are relying on hundreds of cameras in the underground transit system to help identify and capture suspects responsible for the attacks. The massive terrorist bombing July 7 in London is spurring efforts to install networked video-surveillance systems and other advanced technology in commuter rail systems in the United States to deter similar attacks here. Mass transit systems in the United States have been developing similar video capabilities for years, with a spurt of activity following the Madrid rail attacks in March 2004. But the recent bombings in Great Britain is feeding new urgency. The emphasis on rail security is likely to attract systems integrators, which already are working on camera and security networks in chemical and nuclear power plants, ports and government and corporate installations. Following the British bombings, Washington, New York and other cities immediately stationed more police officers in public transportation systems as a show of force. But the special patrols are not meant to continue indefinitely, and the emphasis is turning to technology to provide tools to make police more effective over the longer term. Several members of Congress are seeking an expanded federal budget for passenger rail security. This would fund technologies such as video surveillance, intelligent video, biological and chemical sensors, biometric identity verification for transit workers and improved communications with commuters during disasters. "We should step up deployments of remote surveillance technologies in mass transit systems, which will help prevent attacks as well as aid the capture of those responsible," Rep. Christopher Cox (R-Calif.), House Homeland Security Committee chairman, said July 7. Demand is expected to increase for networked video surveillance and one of its subcategories, intelligent video software. "I have every indication that demand has increased, especially for cameras that provide situational awareness," said Clara Conti, chief executive officer of Ipix Corp. of Reston, Va., a maker of 360-degree, advanced video-surveillance cameras. The video-surveillance market was expected to grow from $7 billion in 2005 to $13 billion by 2010, but growth likely will accelerate as a result of heightened security interest following the British attacks, said Joe Freeman, president of consultancy J.P. Freeman Co. Inc., Newtown, Conn.
"There is no question that this will increase interest in video surveillance," Freeman said. "There is a huge need for evidence. Forget Sherlock Holmes -- everyone wants pictures." Many mass transit systems have closed-circuit television capabilities, but most are switching to digital cameras that are networked with each other and with other networks -- requiring systems integrators -- and that process is likely to speed up, Freeman said. "Federal, state and local agencies, they all want networks," Freeman said. EDS Corp. and Northrop Grumman Corp. and have entered the growing field of integrating cameras at facilities such as ports, chemical plants and urban centers. The submarket of intelligent video software is small but is experiencing explosive growth, Freeman said, though he declined to provide an estimate of revenue. The software lets the camera sound an alarm when it identifies events of concern, such as the separation of a person and an object, which would occur when a package is left unattended, or entry of a person into a restricted area. The goal is to interrupt a terrorist act or crime in progress. Intelligent video software is "expensive, difficult to use and subject to false alarms," Freeman said. In one pilot project, the Homeland Security Department awarded a contract June 30 to Epsilon Systems Solutions Inc. of San Diego to integrate intelligent video and radio frequency identification technologies to monitor rail lines that pass through Washington. The contract is worth $9.8 million. "We are excited about the opportunity to integrate cutting-edge technology into a system that will allow DHS, law enforcement and railroad personnel to monitor this critical stretch of rail line for suspicious and threatening activity," Bryan Min, Epsilon's chief executive, said in a statement. Other IT applications of interest to integrators include RFID for rail employee ID cards, integration of public communication systems and integration of passive biological and chemical sensors. Homeland security agencies also have tested explosive detection devices and facial recognition software. Meanwhile, Congress is considering legislation to expand funding for rail security. Last month, the Senate Appropriations Committee approved a fiscal 2006 Homeland Security budget of $100 million for rail security. The House version allocated $150 million. But those numbers are set to rise this week. Sen. Joseph Biden Jr. (D-Del.) is expected to offer an amendment to add $1.2 billion for rail security over the next five years. Sen. Charles Schumer (D-N.Y.) wants to double rail and mass transit security spending to $200 million and double bus grants to $20 million. "Following the attack on Madrid's rail system, the terrorist attacks in London is our second wake-up call to greatly improve our rail and mass transit security here in America," Schumer said July 7. The Bush administration has been criticized for focusing too much on aviation and not enough on mass transit and rail. For example, the fiscal 2006 request included $4.7 billion for aviation security and only $32 million for passenger rail, buses and other modes of surface transportation. DHS officials said additional money is available through grants to first-response agencies to protect critical infrastructures -- a pot of more than $3.5 billion a year. But that money has to be stretched to cover all police, fire and emergency medical needs as well as mass transit.